From impressive additions to the Mac demoscene, and classic games, to personal applications, public presentations, and simple databases for small businesses -- all in glorious and crisp black & white -- Apple's HyperCard for the Macintosh was a legendary piece of software. A "Personal Toolkit for Information" that defined the platform, and truly opened up software creation to the non-specialist. And here's an Ars Technica article all about it. 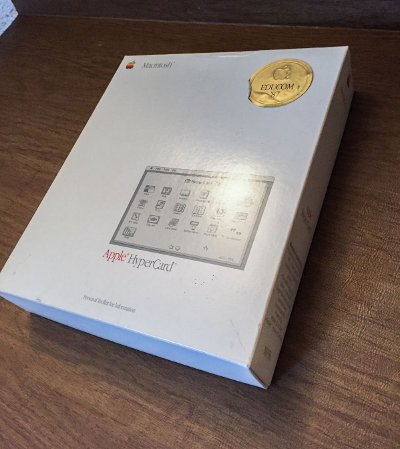 Here, on the other hand, is an Apple Hypercard (Mac) eBay auction for a boxed copy of the application. Inside the elegant and finely preserved box you will find the four 3.5" disks, the user's guide, a license agreement (apparently Apple always loved those), and the Packing List leaflet just to make sure you know what you've got.